Loan duration describes the length of time for a checkout. You can also identify the maximum renewals that can be placed on an item. 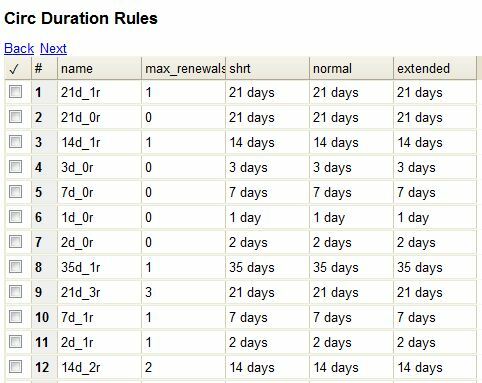 You can find Circulation Duration Rules by navigating to Admin > Server Administration > Circulation Duration Rules. Recurring fine describes the amount assessed for daily and hourly fines as well as fines set for other regular intervals. You can also identify any grace periods that should be applied before the fine starts accruing. You can find Recurring Fine Rules by navigating to Admin > Server Administration > Circulation Recurring Fine Rules. Max fine describes the maximum amount of fines that will be assessed for a specific circulation. Set the Use Percent field to True if the maximum fine should be a percentage of the item’s price. 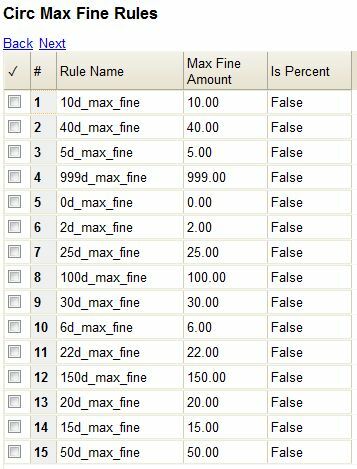 You can find Circ Max Fine Rules by navigating to Admin > Server Administration > Circulation Max Fine Rules. These rules generally cause the most variation between organizational units. Loan duration and recurring fine rate are designed with 3 levels: short, normal, and extended loan duration, and low, normal, and high recurring fine rate. These values are applied to specific items, when copy records are created. When naming these rules, give them a name that clearly identifies what the rule does. This will make it easier to select the correct rule when creating your circ policies. Circulation Limit Sets allow you to limit the maximum number of copies for different types of materials that a patron can check out at one time. 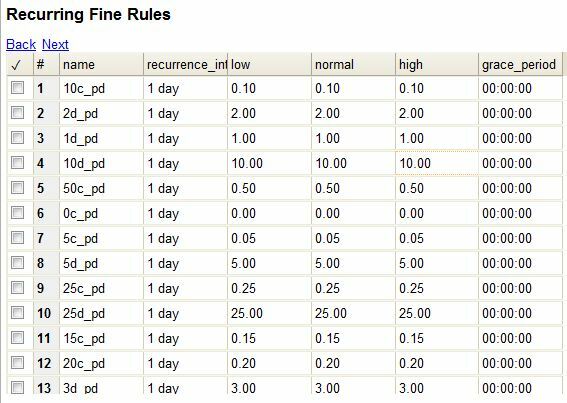 Evergreen supports creating these limits based on circulation modifiers, copy locations, or circ limit groups, which allow you to create limits based on MARC data. The below instructions will allow you to create limits based on circulation modifiers. Configure the circulation limit sets by selecting Admin > Local Administration > Circulation Limit Sets. Items Out - the maximum number of items circulated to a patron at the same time. Depth - Enter the Min Depth, or the minimum depth, in the org tree that Evergreen will consider as valid circulation libraries for counting items out. The min depth is based on org unit type depths. For example, if you want the items in all of the circulating libraries in your consortium to be eligible for restriction by this limit set when it is applied to a circulation policy, then enter a zero (0) in this field. Global - Check the box adjacent to Global Flag if you want all of the org units in your consortium to be restricted by this limit set when it is applied to a circulation policy. Otherwise, Evergreen will only apply the limit to the direct ancestors and descendants of the owning library. Linked Limit Groups - add any circulation modifiers, copy locations, or circ limit groups that should be part of this limit set. Example Your library (BR1) allows patrons to check out up to 5 videos at one time. This checkout limit should apply when your library’s videos are checked out at any library in the consortium. Items with DVD, BLURAY, and VHS circ modifiers should be included in this maximum checkout count. To create this limit set, you would add 5 to the Items Out field, 0 to the Depth field and select the Global Flag. Add the DVD, BLURAY and VHS circ modifiers to the limit set.